The French government is on high alert due to a large amount of UFO sightings over nuclear power plants since October, 2014. The latest sighting in France was just last week, and witnesses in Belgium spotted one in December. Most media outlets suspect that the objects are drones, but not all of the witnesses are convinced. If they are drones, the authorities say they do not know who they belong to. According to Austrian news site ORF.at, there were 18 separate occasions UFOs were seen flying over nuclear power plants in France between early October and early November. They say authorities suspect it is the coordinated effort of an unknown group. ORF.at says the sightings have sparked a debate over nuclear power plant security. Greenpeace has accused the French government of downplaying the danger of these unknown over flights. 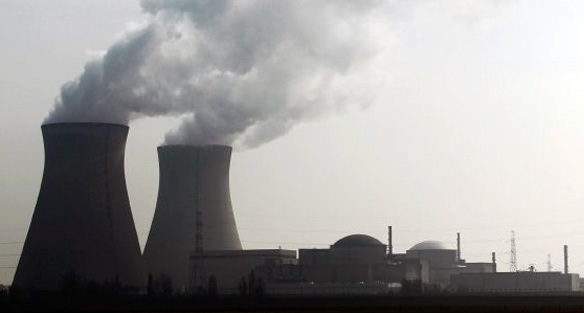 In late December, an object flew over a nuclear power plant in Belgium. The power plant is in Doel, about 10 miles from Antwerp. The news site Spiegel Online, says that plant had been shut down four months ago reportedly due to sabotage. No further details have been released. In November, the UK news site The Independent wrote that three young men were arrested in central France attempting to fly a drone over a nuclear plant. They said the three were “model aircraft enthusiasts.” However, these three were suspected of conducting copycat drone flights. Apparently their drones were simple toys, not like the sophisticated craft believed to be involved with most of the UFO incursions. According to The Independent, “A campaign of harassment by anti-nuclear campaigners is considered the most likely explanation.” Meanwhile, they say the French government remains on high alert. Grewi.de, a website on “frontier-science and the paranormal” ran by Andreas Muller, posted an article this week with witness testimony from civilians who have seen some of these UFOs. According to Muller, the testimony was printed in the latest issue of a Swiss magazine called Mysteries. Writer Robert Fleischer found witnesses at forum-ovni-ufologie.com, a popular French UFO forum. On November 10, 2014 observed three users of this forum in a parking lot close to the NPP Cattenom also a strange object in the night sky The man -. We call him Jaques – mid 50’s and early retirement, he is very careful in the assessment. of what he has seen and his friends. ‘We have a vigil kept, because we finally so wanted to see and photograph a thing,’ said Jacques. The day after received Jaques and his friends a call from the police in Hettange-Grande and were invited to a hearing. ‘For two hours we were interviewed separately, about the appearance of light, about ourselves. Then we were allowed to go. They take it very seriously.’ It was only later learned Jaques that at the time of his sighting of an alarm in the NPP Cattenom was triggered. When the lights but then became stronger, the men attacked the binoculars. One minute remains the object of heaven, above the village of Donzac, in close proximity to nuclear power. It hovers just above the cooling towers. Then it starts to rotate. It appears a second light on the object that flashes quickly. One of the observers believe that the object taking shots. Now the light comes on to the witnesses, then remains stehen- about 20 seconds. ‘It was not hear any noise. On a hill to our right we could hear a tractor, but of this flying object was made no noise.’ The man believes he has something like wings on the object at the ends of light yellow and blue lights. On the underside of a bright red light. ‘The contours seemed very blurry, dark gray,’ he recalls. The apparatus continues its flight direction and eventually disappears from the field of view of an observer. Muller writes that Fleischer is skeptical of the drone explanation, given the descriptions by witnesses. Fleischer suspects there is more to it than French authorities are willing to admit.